NFL Draft Includes Two Badgers ~ The Bucky Channel - The World of Sports from Wisconsin's Perspective. While it's nowhere near as impressive as having three players from your school drafted within the first four picks such as Oklahoma, it was still nice to see two Badgers get the call to the NFL during the draft weekend. Sure, there could be a few more guys get the call as free agents, but it's always a lot cooler to hear your name called on draft day, at least I would assume. 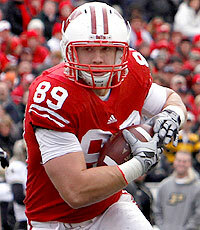 Both of the Badgers that did get the call went in the fourth round, with the first one being tight end Garrett Graham. Graham will be joining former Badger Owen Daniels as a member of the Houston Texans, as he was selected with the 118th pick in the draft. Graham could emerge to be a pretty solid red zone threat for Houston, and I like the pick for them, although I'm not sure how much time he will see right away if Owen Daniels does fully recover from his injury. I do expect a good professional career for Graham though. The next Badger was selected just twelve picks later, as O'Brien Schofield is now a member of the Arizona Cardinals. Schofield did injure his knee in the Senior Bowl and will be out until training camp, but he could be a very valuable player for the Cards. I don't expect either of these guys to be superstars, but they should be solid role players on their respective teams for years to come. And that will probably be our last Badger football post until August.